This is an index of the At Home recipes that I’ve shared in my blog posts. (Yes, The Commissary Carrot Cake recipe is included below). 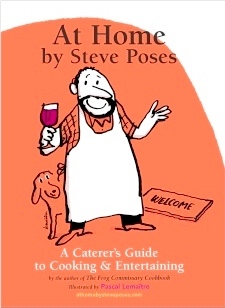 For hundreds of more recipes, please consult a copy of my latest cookbook, At Home by Steve Poses: A Caterer’s Guide to Cooking & Entertaining or At Home Online (the book owner’s website). Get new blog posts e-mailed directly to you! On the Road: Rome & Naples I. At Home By Steve Poses Blog · More Parties. Better. Easier.